“I love to see things grow and bloom,” said Audrey Kershaw. The Flamborough resident is referring to her garden, but the sentiment can be equally applied to her philosophy on charitable giving. 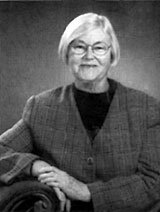 When she retired from the Board of Education, Mrs. Kershaw began reviewing her charitable giving. Confronted with so many choices and worthy causes, Mrs. Kershaw looked to the Community Foundation for a solution.